If you are at the show this week, come on by the Micro-Lounge and say hello. We are extremely easy to find near the main entrance between Blackmagic and Legrand brands. C3888. Our friends at VidCAD are right next door and they can show you more on our integration - passing projects back and forth between platforms for the best in project proposals and documentation. 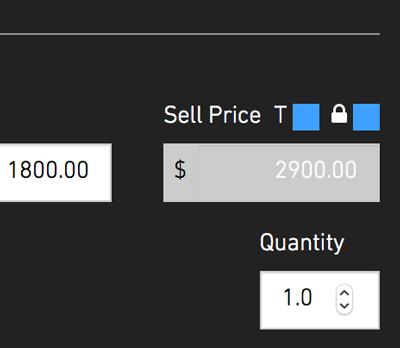 Click the new LOCK checkbox next to any item's sell price field. This will lock that price in as you perform any global markup/margin adjustments. All unlocked items will be updated, but any locked items will be left alone. Coming soon is your new Project Management Home Page, giving you the status of all your projects in construction at a glance. Open one up to see a full timeline for the project and its status. Thanks again for using Jetbuilt - happy quoting! ISE is only a month away, and we are looking forward to another great time meeting new and familiar faces. Last year our stand was a bit hard to find to put it nicely. So this year we decided to take our budget and put it into Beer. We are setting up demos in pubs, cafes and hotels around the RAI this year. Let us buy you a beer or lunch while we show you the power of Jetbuilt. A bit of a break from being on your feet all day. Just visit Jetbuilt.com/ISE to check out our show page. Send the link to any friends you have going to the show as well. From there you can book a demo, a beer, as well as follow along with the show from home. Our Client Management has grown into a full CRM over the last several months. Many of you have been holding off from moving into a new CRM in hopes that ours would provide the minimum set of features you are looking for. Many of you who use other CRMs tell us you only use a portion of the features, and have been hoping to roll that into your Jetbuilt workflow. Well, the Jetbuilt CRM is here, and we are getting great response to it already. Not only can you manage all your clients and contacts in Jetbuilt, you can assign tasks for you or your team to clients and their projects. You can also create Opportunities with a starting budget, so that you can track your pipeline of all future projects including these projects that don't yet haven't yet been populated/estimated. COMING SOON - PROJECT FACTORS! In the next few weeks look for Project Factors. Factors allow you to sell or credit amounts to your projects on a global basis. You can set them to charge based on a percentage or Equipment, Labor or Both. You can charge a price per days on the job, or just flat pricing as desired. Also, as Admin, you can setup certain Factors to be required for all new projects. These factors will automatically appear on projects and are only editable or deletable by Admin. But in this one tiny way, we do share a very critical value: We believe that bolting on feature after feature is not always in the best interest to us or to our users long-term. We take a very careful approach analyzing what can and should be done inside of Jetbuilt, with what can and should be happening in the industry as a whole. Watch the video below for the whole story. We have rolled out a first iteration of our work order functionality. This is exciting, as so many of you have been asking for this. Like the video discusses, this is a minimal work order, and we are already taking in some terrific feedback which we are now beginning to design in. Rather than us designing the complete functionality, we are once again allowing you the users to design where it goes. This week we were at InfoComm’s AV Executive Conference in Miami. I was asked to write and present the “Homework Express” exercise for the event. The theme of the event was selling “experiences” rather than boxes, or functionality. This has been a passion of mine during my career in AV. After all, our tech systems should inspire, excite, or even deeply sadden if that is the goal (the tech systems at Auschwitz Holocaust Museum is an example of that). I put together an exercise where we listened to the "rant" of a client, then curated results that delivered the experience we felt the client was looking for. Let me know if you are interested in learning more about this experience exercise. I would be happy to send you some of the materials. 1 - Scope and Discussion Page text fields are no longer in small overlays. They are now full-screen text fields right on the builder page itself. This makes it much easier for you to type, paste and edit large multi-page text for your projects. 2 - All labor categories are not optionally taxed. You can now select to collect tax on each and every installation type independently. This allows you far more flexibility to properly collect tax on certain labor types and not others. Isn't tax fun? Watch the video below as Paul discusses selling experiences, explains these new features, and gives a sneak-peek at two exciting features coming in the next few weeks. This demo-style video shows the power of our iPad application in a real-world environment. I will walk us through a basic conference room consultation -- creating a new project, adding the items, then selling the project. Remember, our iPad application is the perfect consultation tool for larger projects, and for smaller projects it can be a complete sales tool: building, quoting, and selling a project. This week we have reworked how you enter text to your Scope and Discussion Page areas. Rather than the small overlay box, you can now type right on the full-width Builder page. Click "Edit Scope" as you always have, and you will see the new text area. The area will continue to expand as you type.. This update allows for longer pages of text to be edited and proofed with more efficiency. Enjoy! EDIT LINE ITEMS IN BATCHES! This week we launched our new EDIT ITEMS button in the Builder. Click that button and discover a world of editing, copying, grouping, deleting and more. One very powerful new thing you can do is to copy a group of items to another project. Many of you have been asking for this since the dawn of Jetbuilt. Give the video one minute of your life, and save hours of your estimating work forever! THANKS AGAIN TO ALL OF YOU FOR YOUR SUPPORT AND ENCOURAGEMENT AS WE CONTINUE TO BUILD OUT THE BEST AV/IT PROJECT BUDGETING, ESTIMATING, PROPOSING, AND CLOSING CLOUD SOFTWARE ON THE MARKET TODAY! JetbuiltGO is now live in the app store. This is our client-facing app, where you can build, propose, then sell your project all inside the app. For larger projects, this is the perfect consultation tool. Take your site photos, your scope notes and drop various key items into your project. Then when you get back to the office, it is all there for you inside your usual Jetbuilt environment. Watch for the video tutorial in the next few days. For those of you wanting a more condensed proposal, now you have it. You can present over three times the items on a page with this page type. To add this page to your reports, simply add a new "Report" page type from the designer, then select the "Condensed" type from the template selection. This week we added our additional labor fields for Enterprise users. You can now setup four labor names, rates, and costs within each of the 4 categories. This allows far more flexibility for low, medium and high level engineering or programming. Or rough-in labor and finish labor. You can add and edit these labor types in your company settings page. You will then be able to allocate time to each product as you build your projects in the builder. Jetbuilt's estimating and proposal solution is a powerfully fast and graceful tool for any AV or IT contractor. But for larger organizations, it has lacked certain interoffice tools. Jetbuilt Enterprise solves this with a suite of features to help larger organizations - or any company - looking to control and monitor use, progress and more within the platform. As a big Thank You to our Jetbuilt family for growing along with us, we are offering you Enterprise for the $49 Standard price for the life of your subscription. It is important to revise your team accordingly, then migrate those users by that date. Feel free to call or email Grant or myself to discuss if Enterprise is the right fit for your team! As part of our coming Enterprise platform, we are happy to introduce a new Company Reports area. From your main navigation menu, click "Reports" and you will see our first two reports. "Pipeline by User", and "Pipeline by User Detail". These allow visibility into your company's pipeline - broken out by each member of your team. We are making these and all Enterprise functions available to you as we have promised to "Grandfather" you into Enterprise for the price of our Standard platform. Many of you have been asking for a way to pull in new pricing or other data to all of your items inside a project. Today it is available for your use. In your project's "Additional Tools" area, click the "Push/Pull" button. You will see the various options on a confirmation overlay. Be careful with this one as you will be overwriting plenty of data with one click. Many of you have been beta testing our new iPad app in real-world project applications. We have been taking the feedback and ironing things out daily. We expect to release the first version to all Jetbuilt users in the next few days. Feel free to check back at the App store soon. A BIG WEEK AT JETBUILT! CEDIA • Today we are gearing up for CEDIA 2016 in Dallas, Texas. Those of you at the show, please stop by booth 8205 and say a big howdy. IPAD APP • This week we are premiering our new iPad app. We will be showing it at the show, and look for it in the App Store later this week. SEARCH IMPROVEMENTS • We just launched major enhancements to our search functionality. Dramatic speed improvements and you can now search Bundles directly. If you are in Dallas this week, you are welcome to drop by the Jetbuilt Social event at the Hyatt. It will be a great time to relax and get to know some new friendly folks in and out of the Jetbuilt community. Here in the U.S. we present a "lower than actual" price, only to add Sales Tax right at the end. It goes with our culture I suppose. For you, the refined countries, you include tax from the outset. You can now easily do that in Jetbuilt. In the Designer, click "Edit Line Items" and use the new "Show Tax Included" option. You will then see your VAT, your GST, your TAX, included in every area of the line item proposals. Many of you have been using Jetbuilt to build your RFPs for your Universities, Theme Parks, Airports, Churches and more. Last week we launched a new functionality in Jetbuilt that allows you to deliver them inside of Jetbuilt directly to your vendors. But this sharing is intended to run both ways. Many of you integrators have been asking if you can share your projects with your tech-savvy clients. They can view their project, even make edits and additions to it. You can also share with sub-contractors, integrator partners, product vendors and more. Last week we launched our Change Order functionality. As promised, here is the short tutorial video. The video also covers our "Options" functionality, as they are very much related. Enjoy! • Copy/Move Items. This new tool allows you to move or copy any number of items from a room to any (or all) other rooms at once. Find this powerful tool in the "Additional Tools" section in the builder. • Tax on Equipment as an option. We added the ability to select whether or not to tax equipment line by line. You can also set a preference in your company settings. • Labor and Equipment tax indicators in builder. You can now scan your list of items in the builder and see if labor or equipment is being taxed. Additionally, you can click in the builder list to change the state. Here is a sneak peek at our new project sharing. Many of you have been wanting to share your projects with sub-contractors, commercial clients, and others. Additionally, many of your tech savvy clients already self-design or create their RFPs. Now they can do it in Jetbuilt, then simply share the project with you as a hand-off. Watch the video now, then watch for the roll-out on Monday. You can now sell Change Orders within Jetbuilt. While it seems so obvious to everyone that we needed Change Orders, there were many incremental steps that needed to be taken to get here. For those of you familiar with our Options functionality, Change Orders works in the same manner. In fact, once your project is in "Construction" stage, all unsold options become Change Orders. Suddenly your client regrets that bad decision, and wants those larger displays you proposed earlier. Your Option is already sitting as a Change Order- simply present it to your client. We will be rolling out a tutorial video on this next week. We have also implemented a new Project Stage Indicator. All projects still begin as a lead, but now you can visually track the current stage in your Project Overview. As your job progresses, simply click the Move button to migrate the project. We are recording when these movements happen, so we can begin to give you much deeper sales analytics on your dashboard. We are excited to add Key Digital as a DPI+ partner. See all of your Key Digital products with your dealer pricing inside of Jetbuilt. We continue to build our Plus partners almost daily. Last week we launched our long-awaited Optional Items functionality. Now you can add packages of items and services, then present it to your customer as optional upgrades (or even downgrades). These items can optionally replace items already in your proposal, and the cost difference is presented to your client. The customer can purchase an option right from the proposal (as shown in the image below). Once sold, you can merge those items into your project (which replaces any of the associated items, if any). As you can imagine, our Optional Items functionality paves the way for our (also long-awaited) Change Order functionality. By later next week you will be able to create change orders for any project in construction. Sell new products and services, credit back items within the original contract, and send a new Change Order proposal to your client. Also launching in the next couple of weeks is our Project Sharing functionality. Many of you are consultants, universities, large churches, theme parks, and more. You use Jetbuilt for RFPs. Soon you will be able to share those RFPs directly inside of Jetbuilt. Your shared project will show up in your recipients project list. They will see your populated items, outlined scopes, drawings, photos and more. They can ask questions, make their item alternates, add their integration factors, and more. You can share a live document that you can both edit, or share a static copy where you do not see their edits. Your recipient will not be able to share this project elsewhere. We are excited to add Aurora Multimedia as a DPI+ partner. See all of your Aurora products and your dealer pricing inside of Jetbuilt. We continue to build our Plus partners almost daily. Almo dealers, the wait is over! Visit your VENDOR area and connect your company to see your Almo pricing as you work in Jetbuilt. Estimate faster! • VIEW MY BUNDLES - In your Vendors/Products area you can now see a list of your bundles, You can also delete bundles in this area. • ENTER LABOR AS MINUTES, HOURS OR PRICE - Enter labor any way you like. • A4 AND LETTER PAGE SIZES - You can now create reports in A4 page size and output them as a PDF. You can set your default page size in your company settings, but still create both sizes at will. • TEAM VIEWING BY PROJECT - Share your project with all or only a portion of your team. Company admin will still see all projects. • U.S. USERS DEFAULT TAX RATES - Some users in U.S. have been wanting to bypass the smart tax rate feature, and simply use a default rate (such as 0% for those that primarily perform government projects). • WIDER BUILDER WINDOW - We have allowed large-screen users to now take advantage of the real estate. Much longer item and description fields can be seen. (This also paves the way for optional additional columns for enterprise users). OPTIONS FUNCTIONALITY - We are in final testing this week for a launch on Monday. You will be able to add option groups such as "Larger Displays", "Optional Control System", "Service Package". These options will be presented in your proposal in detail with scope, but also on your summary page where the customer will be able to purchase these options without the need for an additional contract. IPAD APP - We are in production of our iPad app. (Yes, iPad was the winner based on customer feedback last week 20:1). Drop items into your project very quickly while in front of the client on a walk-through. Expect the app to be available late August. • Project Versioning - In your Project Details area you can create and recall various versions. (Enterprise). • Wider Builder window - Columns expand so large-screen users can experience less truncating. 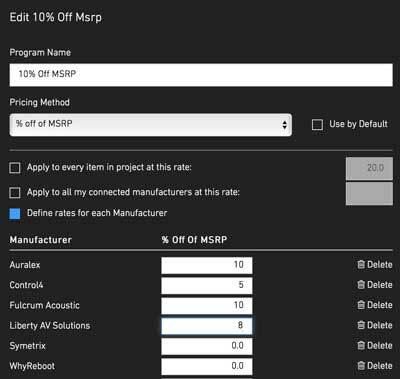 • Distributor Pricing functionality. ALMO distribution is the first to present their pricing. • Your dealer number appears on Purchase Orders. • Ability to delete Purchase Orders. • Ability to remove Purchasing Source from a vendor. • "All Rooms" view option in the Builder. • Client Name and City added to search in projects list area. • Ability to move an item to a different room. We have heard you tell us (many times) that you want a tablet app. We have been working on the design for some time. The app is designed primarily for very fast client-facing project population. Walk through projects with a client, and simply drag Jetbuilt Bundles or Favorites into the rooms. Click to "Mute" a room or system (to present the price differences). Because your labor is already attached to each item you drag in, you will assemble a comprehensive price to the client. This is not a budget-finding tool, this is a job selling tool. The client can then sign to purchase the project right on the tablet, or you can email it to them. We would love some feedback from you about this app. Reply to this email with any thoughts and wishes you might have. Also, please let us know your vote: iPad or Android (to start). While we met so many new potential Jetbuilt users at Infocomm, we were thrilled by how many of you- the current faithful- came by to visit. It was great to be able to meet with so many of you during the show. The clear topic that stood out to us was how much you loved our support. While we did coin a term "Superior Support" for our web marketing pages, we actually mean it. We returned from the show and had to buy the support team a round of beers as congratulations for being the true star of the show. Paul tells us some of what is going on in Jetbuilt now and in the next few weeks. Many more interesting announcements are coming- both at InfoComm and in upcoming newsletters. • View All Rooms in your builder - This is a great new way to see every single item in your project in one (likely very large) list. It is still best to select one room at a time while populating your items, but this feature comes in handy to glance through every item in a single list. • Move item to another room - Now you can move an item to any other room in your project. Simply click the item, then select the room (the same way you have been able to do for systems). • When creating a new project, we will now pull in the client's address fields (when they exist). • Improved project search - You can now search Client Name and City in addition to Project Name. Jetbuilt is becoming more and more of a noted platform for estimating in the AV industry. As we grow, we are making big updates not only in features, but in code and databasing efficiencies. Some of these improvements cause issues to old data. We resolve these issues as quickly as they are reported. You guys are the initial Jetbuilt users. We will not forget that when our Enterprise solution is rolled out in the coming weeks. Dramatic new features built for multi-location companies, multi-salesperson reporting, deeper customization, alternates, Quickbooks Enterprise integration and much more. You existing subscribers will be grandfathered into Enterprise for the standard platform price as a thank you for your loyalty to Jetbuilt early on. Thanks again, and continue with your comments for improving Jetbuilt! • New report page type "Blank Slate". This is perfect for those wanting to create completely original pages- without starting from our formatted templates. • Fully edit your Bundles. 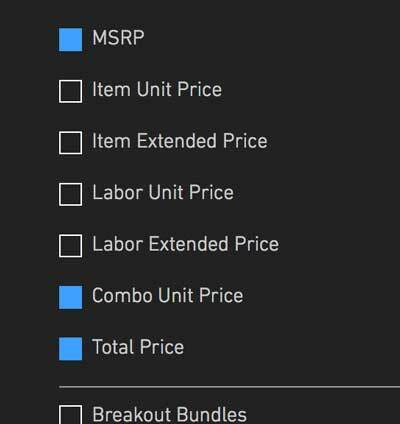 Just click the "Edit" icon near the Bundle Name within the builder. You can add and remove items from that bundle for your current or future projects. While most large-scale projects typically have a fully documented AV design from which to bid, sadly the majority AV projects require some or all of the design to to be done just to put together a quote. We are expressing various solutions to this common issue- please join us June 2, 10AM PST for the webcast. If you have your own interesting solutions, reply to this email. We have already received many great ideas which we will be sharing, send us yours as well!